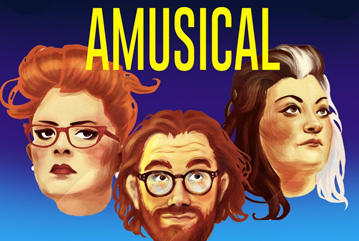 Hosted by Jayde Adams and Kiri Pritchard-McLean, Amusical is a celebration by the comedy world of all things West End (or Broadway if you’re American, or more well-off than us). A handful of comedians, assisted by our in house band Dave and The Quavers, will go up against each other to perform their favourite musical theatre song from stage and screen, and it’s up to YOU, the audience, to determine who is best. Well, who your favourite is anyway. They may well not be the best. The winner wins a donation to the charity of their choice, as well as the real prize closing the show with their ultimate encore song. If you love comedy, musicals, and comedians almost certainly getting horribly drunk to cope with the nerves of performing on a West End (Kilkenny) stage, this is the night for you. Line Up TBA but previous acts include: Sara Pascoe, Lolly Adefope, Nish Kumar, Aisling Bea, Greg James, Richard Gadd, Liam Williams, Josie Long, Ellie Taylor, Evelyn Mok, Matt Richardson, Suzi Ruffell, John Robins, David Morgan, Spencer Jones, Alex Zane, Bobby Mair, Harriet Kemsley, Chris Addison, Ed Gamble, Joel Dommet, James Acaster, Michelle McManus & Felcity Montagu.